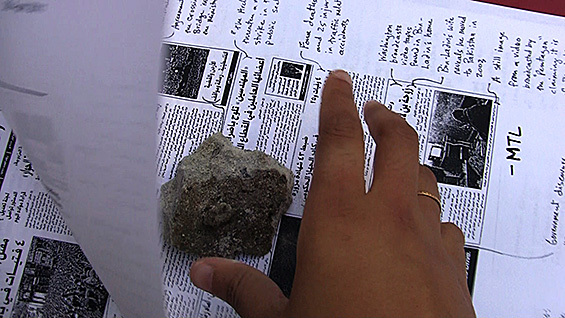 The Interdisciplinary Seminar at The Cooper Union presents a free public lecture by MTL Collective (Natasha Dhillon and Amin Husain) that will explore the blurring of the lines between art and activism. "The domain of the Strange, the Marvelous and the Fantastic, a domain scorned by people of certain inclinations. Here is the freed image, dazzling and beautiful, with a beauty that could not be more unexpected and overwhelming. Here are the poet, the painter, and the artist, presiding over the metamorphoses and the inversions of the world under the sign of hallucinations and madness." What if, when we speak of art after Occupy, we put “art” under erasure? What if we strike against art to liberate art from itself? Not to end art, but to unleash its powers of direct action and radical imagination. Art does not dissolve into so-called real life. It revitalizes real life by making it surreal. This surreal spirit is less that of Breton's European vanguardism than Suzanne Cesaire's freedom dream, informed as it is by the ongoing histories of slavery, imperialism, and debt. Art defamiliarizes life, asking us how do we live, and why do we live this way? It challenges us to respond to this question through research, aesthetics and action, acknowledging that we ourselves are responsible both for our freedom and oppression. And, what if, when we strike art, we imagine a refugee camp collaged into the symbolic heart of finance capital. We imagine a self-organized commons installed at the ground zero of empire, or imagine an empty minimalist plaza flooded with bodies and voices and cameras, de-occupations of New York City and Palestine, and a never-ending process of experimentation, learning and undoing, resisting and building in the unexplored terrain of an historic rupture. This lecture explores the blurring of the lines between art and activism. MTL shares a body of work in connection with Occupy Wall Street, Gulf Labor Coalition, and Palestine, which seem to sketch the possibility of a practice in which the artist’s work does not simply add an artistic flair to this or that campaign, but rather theory and research, action and aesthetics, debriefing and analysis — this entire dialectical process — is the art practice. Nitasha Dhillon and Amin Husain are MTL Collective, a collaboration that joins research, aesthetics and activism in its practice. Nitasha is a visual artist based in New York and New Delhi. She has a BA in Mathematics from St. Stephen’s College, University of Delhi, and has attended the Whitney Independent Study Program in New York and School of International Center of Photography. Nitasha is currently a Ph.D. candidate at the Department of Media Study - State University of New York - University at Buffalo. Amin is a Palestinian-American lawyer, artist, and activist based in New York. He has a BA in Philosophy, a JD from Indiana University Law School, and an LLM in Law from Columbia University. He practiced law for five years before transitioning to art, studying at the School of the International Center of Photography and Whitney Independent Study Program. Amin currently teaches at the Gallatin School - NYU, the Media Culture and Communication Department - NYU, the New School’s Media Studies Department, and PRATT’s Graduate Writing Program.